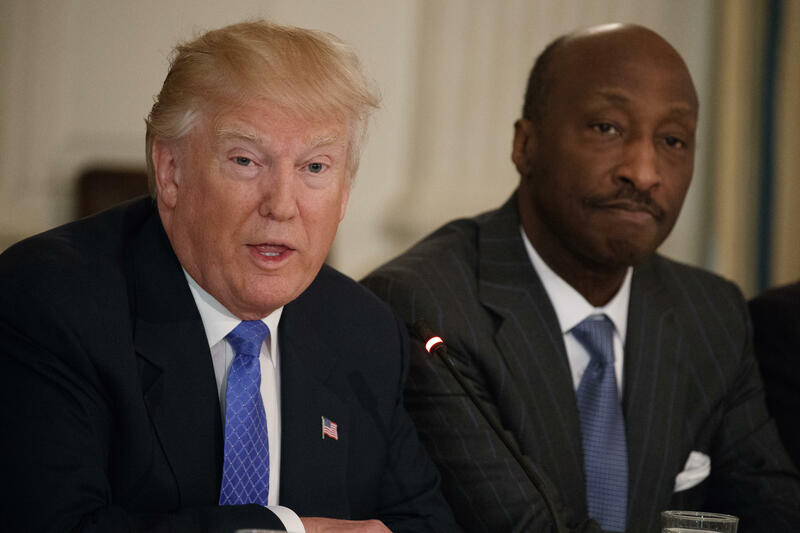 President Trump on Monday lashed out at the CEO of Merck, Kenneth Frazier, who resigned that morning from the president's manufacturing council. Mr. Trump responded to Frazier's decision on Twitter, mockingly saying Frazier will now have more time to "lower ripoff drug prices." Frazier, who is black, said in a statement, "Our country's strength stems from its diversity and the contributions made by men and women of different faiths, race, sexual orientations and political beliefs." "America's leaders must honor our fundamental values by clearly rejecting expressions of hatred, bigotry and group supremacy, which run counter to the American ideal that all people are created equal," he added. Frazier said that "as a matter of personal conscience," he said he feels a responsibility to "take a stand against intolerance and extremism." A Merck spokesperson declined to respond to Mr. Trump's tweet and said that Frazier's statement "speaks for itself." This comes as the president has come under fire for the way he has handled the domestic terror attack in Charlottesville on Saturday and the violence involving the white supremacist events in the city over the weekend. Mr. Trump on Saturday condemned hatred "on many sides," which prompted backlash from both Democrats and Republicans alike. An unnamed White House spokesman released a follow-up statement Sunday saying that the president condemns "all forms of violence, bigotry and hatred, and of course that includes white supremacists, KKK, neo-Nazi, and all extremists groups." When he landed at the White House on Monday morning, the president headed toward the East Wing, ignoring shouted questions like "will you condemn the actions of neo-Nazis?" and "Do you condemn the actions of white supremacists?" The president just politely waved to the press without answering. CBS News' Margaret Brennan and Alana Anyse contributed to this report.